Interior Secretary Ryan Zinke testifies during a Senate Energy and Natural Resources Committee on June 20, 2017, in Washington, DC. But Clement wasn't the only leading climate scientist at the DOI who was targeted. As part of a radical, department-wide restructuring that Secretary Ryan Zinke has described as “probably the greatest reorganization in the history of the Department of the Interior,” at least two dozen senior executive employees have been moved to new positions. Although new administrations often shake up agency personnel, the transfers of senior officials at the DOI are unprecedented in scale and, in several cases, viewed as politically motivated or designed to intimidate staff who work on environmental issues. 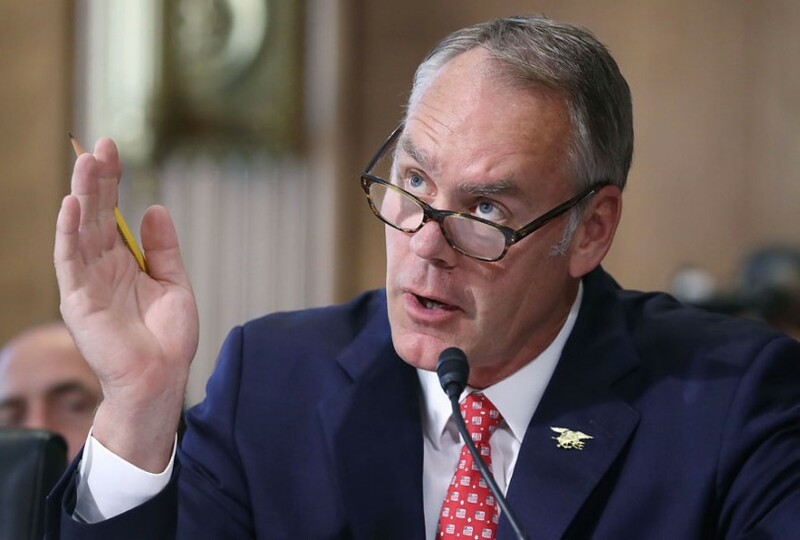 Zinke has defended Trump's plan to reduce the DOI budget by $1.6 billion next year, costing roughly 4,000 employees their jobs and rolling back many of the regulations put in place by the Obama administration. DOI's staff shakeup is an unprecedented, politically motivated reorganizing of agency goals. Among those shuffled around at DOI is Dr. Virginia Burkett, a 2007 Nobel Peace Prize recipient. Among the initial transfers at the DOI was Dr. Virginia Burkett, the former associate director for Climate and Land Use Change at the United States Geological Survey (USGS), who contributed to several reports on climate change by the Intergovernmental Panel on Climate Change (IPCC), which was awarded the Nobel Peace Prize in 2007. According to interviews with several DOI employees, Burkett was originally reassigned to the office of the assistant secretary for Water and Science, which would have moved her from overseeing vital climate-science research at USGS to an as yet undefined advisory role at DOI headquarters in Washington. Burkett, who joined the DOI in 1990 and has been at the USGS for more than 15 years, is an internationally recognized expert on climate change, sea-level rise, and coastal wetlands. She has written extensively on the impacts of climate change on coastal communities, as well as on strategies for adaptation. As an adviser to the assistant secretary for Water and Science, it's unclear what her new role would have been. The office reports directly to newly named Deputy Secretary David Bernhardt, a former high-powered lobbyist who had previously sued the DOI and whose conflicts of interest related to water-use issues have been well documented. Matt Larsen, former associate director for Climate and Land Use Change at USGS who now heads up the Smithsonian Tropical Research Institute, said that, under normal circumstances, Burkett could have played an important role in shaping policy on national water-resource issues. “In her case, the reassignment was a reasonable one,” Larsen said. “It was in line with her expertise, assuming that the special adviser would have been asked to give advice about climate science and land-use-change science.” But Larsen noted that her role would ultimately be limited to serving the administration's political agenda. At least two dozen senior executive employees have been moved to new positions. As a citizen Donald Trump dismissed climate science as a “hoax,” and as president he has continued to undermine the role of science in guiding government policy. References to global warming have been removed from government websites, and regulations designed to limit greenhouse-gas emissions—many of them promulgated through the DOI—have been reversed. Most notably, Trump pulled out of the Paris climate accord. Although Secretary Zinke paid lip service to climate change during his confirmation hearings, the DOI seems to have fallen into line with the administration's overall agenda of suppressing climate science. Just a week before Clement blew the whistle, another USGS climate scientist was told not to attend a tour of Glacier National Park with Facebook chief executive Mark Zuckerberg. According to a leaked draft of a USGS science-guidance memo obtained by The Nation, the word “climate” is quietly being scrubbed from various program titles and research initiatives. Under the Trump budget, the Climate and Land Use Change mission area has already been renamed the Land Resources mission area, suggesting that climate-science research will no longer be a priority. Funding for climate-science centers, which are on the front lines of helping regional and local natural-resource managers adapt to climate change, will be reduced from $25 million to $17.4 million, and the agency is preparing for the possibility that four of those centers will be shuttered. The memo instructs program managers and scientists to focus on a small subset of existing projects and research priorities rather than seeking funding for any new initiatives. As a citizen Donald Trump dismissed climate science as a “hoax,” and as president he has continued to undermine the role of science in guiding government policy. Notified of her reassignment in mid-June, Burkett was given just 15 days to accept the new position, resign, or retire. But instead she was able to negotiate a departure from the Senior Executive Service, the upper echelon of federal government employees, and return to her previously held position as chief scientist of the Climate and Land Use Change mission area, taking a pay cut in the process. Reached by phone as she was driving from Virginia to Louisiana, where she'll be stationed, Burkett said she preferred not to speculate on the reasons for her reassignment. “I'm sure it would have been a different role,” she said. “The office has a different mission.” Burkett, along with two other DOI employees, did express concern that no one had yet been named to fill her old job as Associate Director for Climate and Land Use Change at USGS, a key leadership role. “There are hiring freezes presently, and I'm just unclear about how and if the position will be refilled,” Burkett said. This story was reported in partnership with The Investigative Fund at The Nation Institute, now known as Type Investigations, where Adam Federman is a fellow.